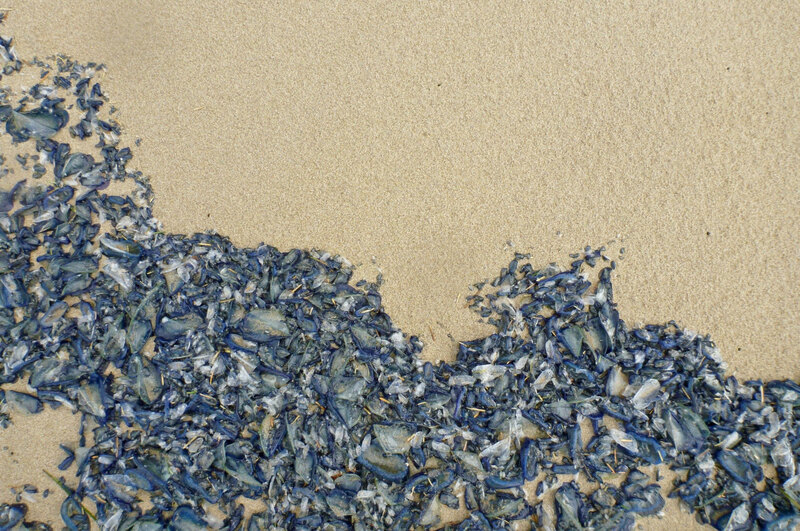 This spring, small blue jellyfish-like creatures washed ashore by the millions turning beaches blue in places. These abundant little hydroids are called by-the-wind sailors, Velella velella. I like the clean, squiggly cut of the drift line, splitting the beach between clean sand spattered only by raindrops on the high side, and the accumulation of Velella on the low side. Prev How Stable the Starfish? What a lovely description for the picture! I enjoyed it so much. Actually, I love reading short posts with deep meaning. You got both! Followed you to learn more from you! Thanks! That’s quite a compliment. The photo challenge was new to me but right up my alley. I just checked out your blog, Ha! I loved your Furry Friends post about Elliott. Lucky little dog.